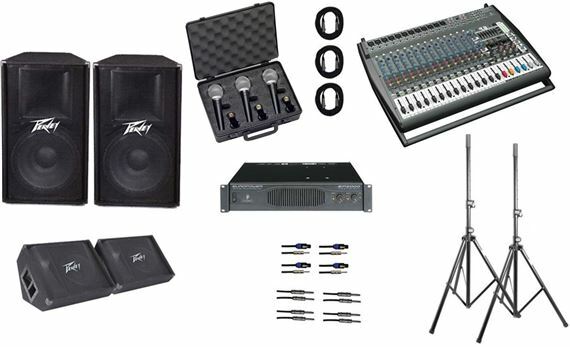 Shop AMS Behringer Peavey Tour Portable PA Systems from AMS with 0% Interest Payment Plans and Free Shipping. Just plug and play! The AMS Tour portable PA system lets you set up in minutes and jam all night long. The 1600 watt powered mixer has multiple inputs for all your band members to get connected and enough power to rock the house. The 15 inch main cabinets provide lots of low end with well defined mids and excellent high end response. A versatile sound system for any sized venue or type of music. Buy the Tour PA System now and start booking your band. The AMS Tour Upgraded comes with the Peavey PV215 which is a 2x15-inch, full-range, passive, 2-way PA speaker cabinet, which handles 700 Watts of power (program, 1,400W peak), with a wide frequency range, all for a nearly unheard-of price. Its typically rugged Peavey durability includes 3/4-inch MDF construction, metal handles, a full metal (not plastic!) grille, heavy duty carpet and Peavey's Sound Guard III HF driver protection network. Its components consist of two heavy duty 15-inch woofers and the Peavey RX14 1-inch compression driver on a large format horn for smooth vocal performance. The upgraded system also offers three boom mic stands inplace of the dual speaker stands. 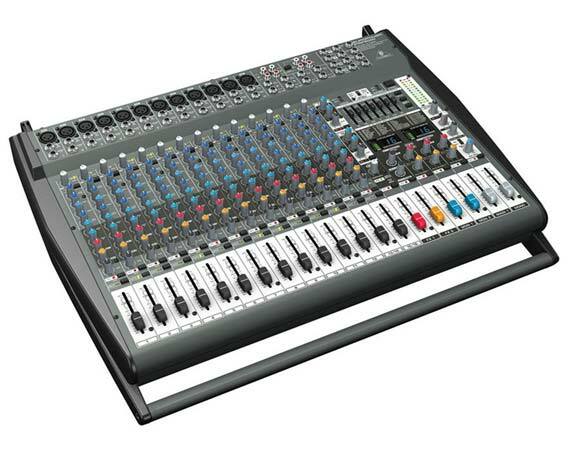 The PMP6000 is a 1600-Watt 20-Channel Powered Mixer with Dual Multi-FX Processor and FBQ Feedback Detection System. These new mixers produce even more power than their predecessors while maintaining a famously low weight and high efficiency. The PMP6000 employs Class-D technology including a new switch-mode power supply, significantly reducing weight and heat. The 20-channel PMP6000 features 12 built-in XENYX preamps plus 24-bit FX processors and FBQ Feedback Detection. The Behringer EP2000 Europower is an extremely musical power amp that can take a whole night's worth of abuse without missing a beat - even at 2 Ohms! It seems almost too good to be true but it this is the real deal! The Peavey PV115 is a full-range, 2-way PA speaker cabinet, which handles 400 Watts of power (program, 800W peak), with a wide frequency range, all for a nearly unheard-of price. Its typically rugged Peavey durability includes 3/4 inch MDF construction, metal handles, a full metal (not plastic!) grille, heavy duty carpet and Peavey's Sound Guard III HF driver protection network. Its components consist of one heavy duty 15 inch woofer and the Peavey RX14 1 inch compression driver on a large format horn for smooth vocal performance. Peavey has seriously raised the bar in value-priced, high-performance PA speakers with the new PV115. 8 ohms. The PV115 has two 1/4 inch inputs so it's ideal for chaining a pair (or more) of them together, to run from the same amp. This is everything you need for most gigs. Good quality equipment for a good price. Amazing deal! All of this great gear for such an affordable cost! This system gives great live sound and the mixer is incredibly versatile. The whole system sets up in less than 30 minutes and is super easy to use. EXCELLENT starter kit. If you arent going to add a sub then this is perfect as is. IF you would like to add a sub or 2 to this then my advice is to grab an additional p and a crossover. Once I did my life changed lol. Love this PA system. It’s easy to set up and operate. The sound is great and is really professional looking clean. I recommend this PA from anyone who’s new or been around equipment a lot. This set up is awesome. Easy to set up and the power is awesome. I've only used the items in this package 3 times so far and the sound and quality is great. Not to mention you just can't beat the price. What can I say, AWESOME!! I have never been more satisfied with a purchase! Your company is amazing!Can't wait for a session with my band!??? ?